The Internet of Things (IoT) concept has gained a lot of traction over the last couple of years. One of the main applications of IoT lies in the home automation space. Consumers have many options in this space, but none of them have the right combination of comprehensiveness, economy, extensibility and ease of use. Earlier this month, we discussed these aspects in detail and arrived at a set based on which different home automation systems / devices could be compared. 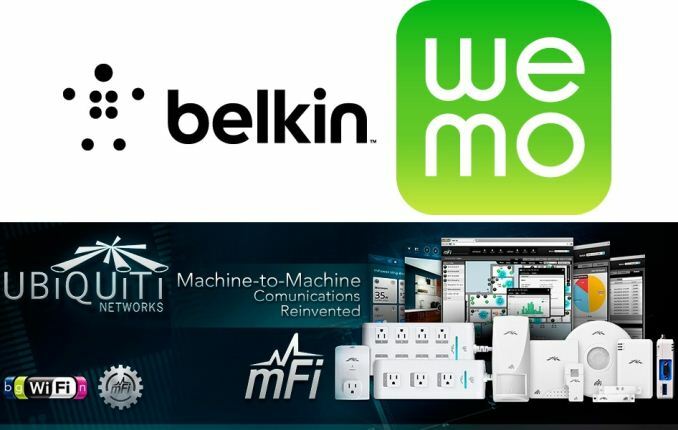 Today, we look at two different solution families - WeMo from Belkin and mFi from Ubiquiti Networks - and compare them using the aspects that we arrived at earlier. Most consumers are very familiar with Belkin's WeMo product line - it has wide retail availability and a great marketing push. On the other hand, the mFi platform from Ubiquiti Networks is probably not known to the average consumer. The primary reason is that it is a M2M (machine-to-machine) communication platform, intended for building automation. In addition, Ubiquiti's marketing push for the product line amongst the general consumers has been non-existent. Their distribution model makes it difficult for consumers to experience the products in a brick and mortar store. Today's review will begin with a look at the members of the WeMo and mFi families and a brief introduction to the usage model for both. For the Ubiquiti Networks mFi, we cover how to setup a home automation controller, and link to the documentation of the APIs. We will also look at the user control interfaces in detail for both the WeMo and the mFi devices. For this piece, we only look at a subset of the devices available in both the product lines. We will also talk about the power consumption aspects in the concluding section. A summary table will simplify the comparison of the two product families across various home automation aspects. What exactly, is the usage scenario of a remote controlled outlet?!? Yeah, you can measure how much power is used, something thats easily done with a regular outlet, but besides that?!? Yeah. Don't see that either. For me I see potential in the light-switch and motion sensor. Turn-on light when entering room, turn off when leaving. But then I doubt this will work that way and reliably especially if more than 1 person is involved. So the sensor would need to track how many people are in the room. It's unclear if this is possible. > Turn-on light when entering room, turn off when leaving. But then I doubt this will work that way and reliably especially if more than 1 person is involved. Has anyone, anywhere the past 100 years ever reached a level of laziness so monumental, that pressing a switch right by the door, becomes a task so arduous and troublesome that it's best left to technology? Personally I prefer natural light, and don't turn on the lights until it's necessary. I doubt I'm the only one, so now your light switch also has to monitor light levels, and whether it's cloudy. Unless of course I just got up, in which case, full on lights right as I enter a room is the last thing I want. So a rules based system would also have to have rule for this.